For the last couple of weeks I’ve kept a food diary and it has been quite the eye-opener. Faced with my diet on paper, I can see patterns in my eating habits and how all those little ‘treats’ are in fact ‘regulars’. There are several improvements to be made and one of them is to reduce the amount of red meat I eat. 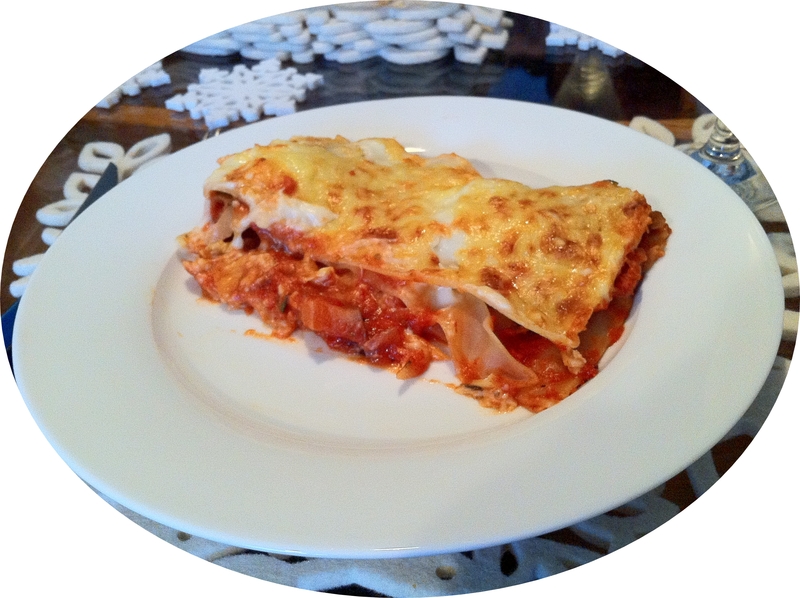 Lasagne is a favourite in our house, I’d usually make it with lamb or beef mince but I remembered back to a time when I ate much less meat and pulled this recipe out of my memory banks instead. I can’t remember if a friend gave it to me or whether I saw it in a magazine but it was at least ten years ago that I first made it. The dense aubergine and the chewy mozzarella add a nice texture that I think can be missing from a vegetable lasagne. Heat the oil in a pan and add the diced onion and crushed garlic. After five minutes or so add the aubergine and stir to coat in the oil. When the aubergine has turned golden add the chopped tomatoes and stir together. If I had any to hand I would have added a splash of red wine at this point. When it has reduced down a little, season and add the chopped basil leaves then turn the heat right down while you make the white sauce. I make a white sauce by heating a large knob of butter in a saucepan, when it has melted I add a tablespoon of plain flour and stir until it has been absorbed, I repeat this until the butter and flour mixture looks like sand. Then I add a splash of milk and stir continuously until it is smooth and repeat until it is the consistency of a sauce. Season with salt and pepper and if you’re a perfectionist use white pepper so you don’t get black pepper speckles in your sauce. I think the trick to a lump-free white sauce is stirring and patience, I always get a little thrill when there are no lumps. Put a layer of tomato and aubergine filling in a large rectangular or square dish, add a layer of mozzarella, a layer of white sauce, then a layer of pasta. Repeat. Top your last layer of pasta with white sauce and grated cheese. If you prefer a less rich dish, omit the layers of white sauce in the lasagne and just have it on top. Put in an oven preheated to 180 degrees celsius (gas mark 4/350 degrees fahrenheit) for half an hour or so, until the pasta is cooked through and the cheese is golden on top. mmh that sounds really nice Ill try that over the weekend. We too a big fans of Lasagne. Thanks for sharing….